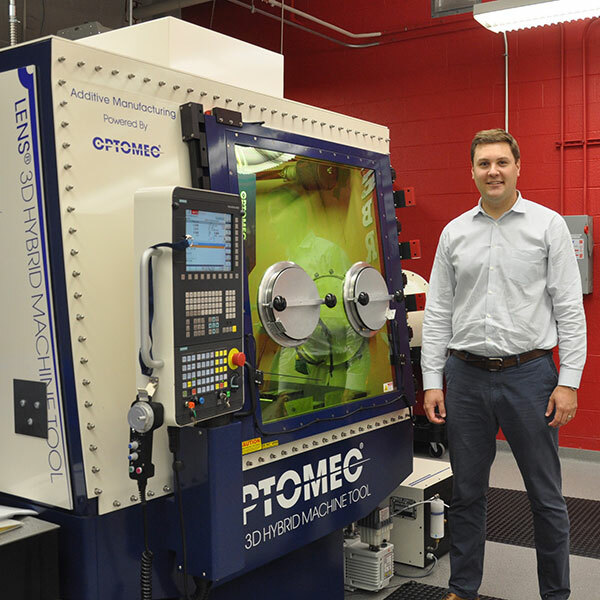 Michael Sealy, assistant professor of mechanical and materials engineering, and his team are using the Optomec LENS 3D hybrid printer in the NEAT Labs to develop a process for manufacturing customized, dissolvable magnesium surgical implants. Utilizing a first-of-its-kind controlled-atmosphere system in a 3D hybrid printer, Michael Sealy and his team of Nebraska engineers are developing a process for manufacturing customized, dissolvable magnesium implants that can reduce risks, costs and suffering of surgical patients. The research, which Sealy is presenting this week at the International Manufacturing Technology Show in Chicago, is being conducted in the Nebraska Engineering Additive Technology (NEAT) Labs on the Optomec Laser Engineered Net Shaping (LENS) 3D Metal Hybrid Machine Tool. This unique 3D hybrid printer is the only commercially available machine that offers an atmosphere-controlled environment for additive manufacturing of reactive metals, such as magnesium. "Our research is focused on advancing the performance and functionality of dissolvable devices," said Sealy, assistant professor of mechanical and materials engineering. "Using LENS, we are applying a hybrid additive manufacturing process to control the disintegration of medical fasteners and plates so they stay intact long enough to serve their purpose and then degrade away once the bone is healed." Currently, most medical implants are made from titanium or stainless steel, permanent materials that remain the body until they are surgically removed. These metal implants often result in complications, which can include pain and the need for another surgery to have them removed or replaced. Having dissolvable implants available, Sealy said, could eliminate the need for follow-up surgeries, help reduce the risk of post-surgical complications and, thus, reduce costs and suffering for patients.